Elevation: minimum 412 feet, maximum 550 feet. Area Habitat: open land 0.00%, forest 98.33%, wetland 0.00%, open water 0.00%. From Dixon travel .3 miles south on US-41A, turn on Hobart Gardner RD (CR-1161), travel 1.5 miles to WMA. Gently rolling terrain, mostly forested in oak, hickory. Offering deer, turkey and small game hunting, has a small pond on the area. Limited parking. 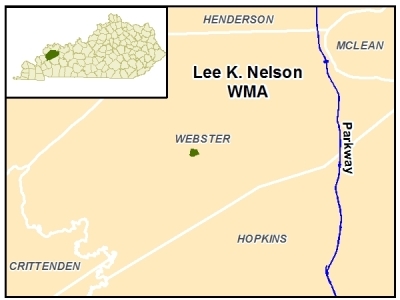 Gift to Kentucky Department of Fish and Wildlife Resources from former wildlife biologist Lee K. Nelson.